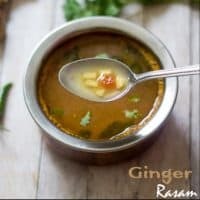 Ginger Rasam | Inji Rasam recipe is a very healthy and tasty rasam which is given to people who have cold and the cold will be cured in just 2 to 3 days itself. 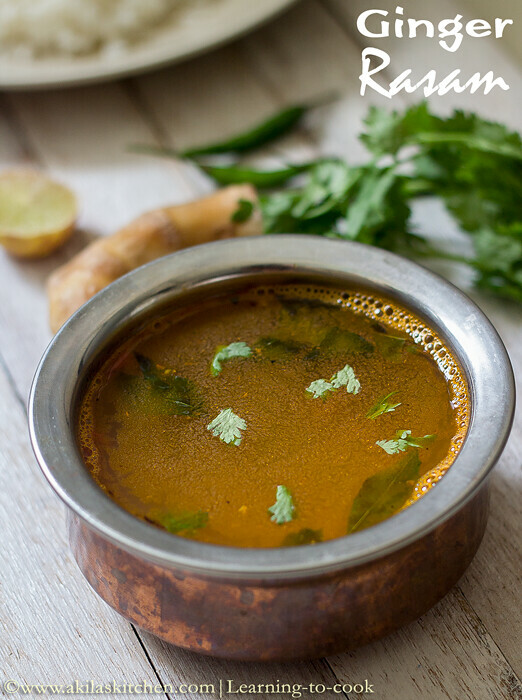 Ginger rasam | Inji rasam recipe with easy step by step instructions for your easy understanding and learning. Rasam is a spicy South Indian Soup which is prepared in different varieties. This Ginger Rasam is one such variety, which is used for sore throat, cold or fever. I used to prepare either this rasam or Pepper Rasam when any body have cold in our family. Ginger has so many medicinal values and my grandmom used to prepare inji kashayam during my childhood days. This inji rasam preparation also has so many variations. I followed a simple recipe for this. 1. Take the ingredients mentioned in To Grind or smash and crush it as shown below. 3. Add the tomato and saute it. Add the remaining ginger pieces. Saute for 2 min. 4. Add the water and the tamarind water. Add the salt, turmeric powder and asafoetida. Allow to boil. Add the coriander leaves and ghee at this stage. 5. Switch off the flame and wait for 2 min. Add the lemon juice now. 6. Serve the hot hot inji rasam. 1. Adding lemon juice is purely optional. 2. If you need more spicy, add the dry red chillies. 3. The ginger and pepper are very good for cold and fever, so i added both in this rasam. But my grandma, used to prepare only with ginger. So you can prepare this rasam without adding the pepper also. 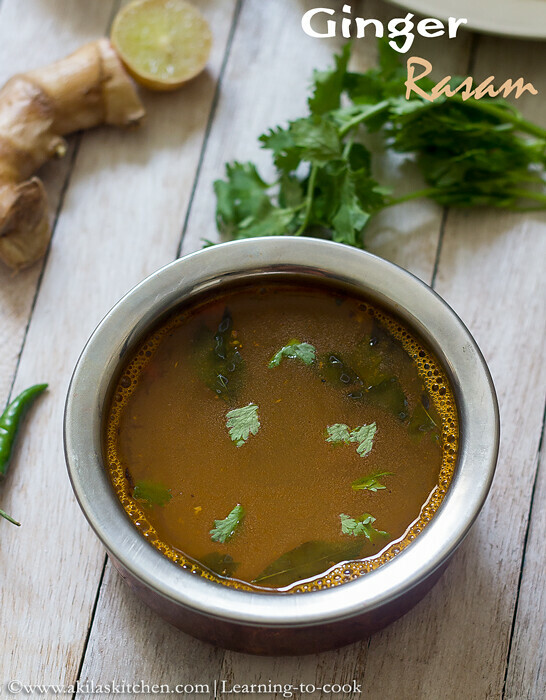 Rasam is a spicy South Indian Soup which is prepared in different varieties. 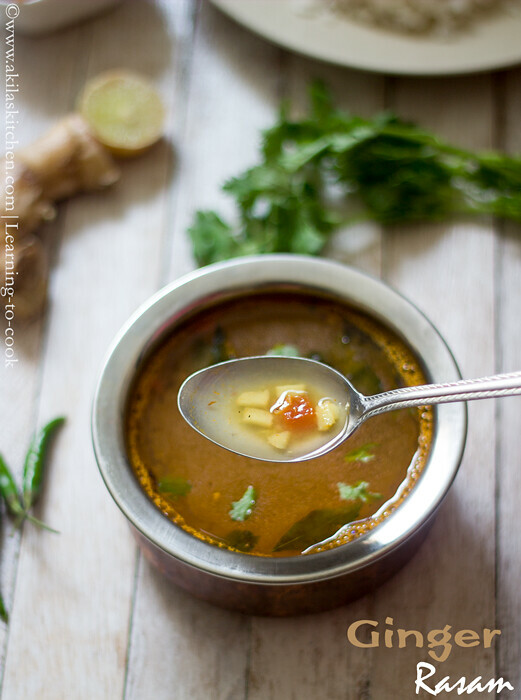 This Ginger Rasam is one such variety, which is used for sore throat, cold or fever. I used to prepare either this rasam or Pepper Rasam when any body have cold in our family. Ginger has so many medicinal values and my grandmom used to prepare inji kashayam during my childhood days. 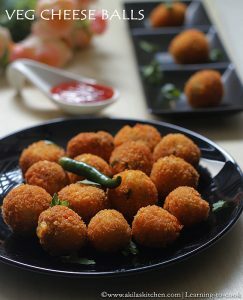 This ginger rasam preparation also has so many variations. Take the ingredients mentioned in To Grind or smash and crush it as shown below. Add the tomato and saute it. Add the remaining ginger pieces. Saute for 2 min. Add the water and the tamarind water. Add the salt, turmeric powder and asafoetida. Allow to boil. Add the coriander leaves and ghee at this stage. Switch off the flame and wait for 2 min. Add the lemon juice now. Serve the hot hot Ginger rasam. Adding lemon juice is purely optional. If you need more spicy, add the dry red chillies. The ginger and pepper are very good for cold and fever, so i added both in this rasam. But my grandma, used to prepare only with ginger. So you can prepare this rasam without adding the pepper also. *Post first published on Nov 21, 2014. Updated with recipe. I am little under the weather right now, love to grab this soup to get well on my feet.